You’d think because this piece has borders and piping that I’ve done all the thread painting – wrong! I started adding borders on the weekend because I was having the second session for the thread painting workshop and I needed to be able to show the gals how I finish a piece. I’d carefully marked (using a heat removable Frixion pen) a centre vertical line, used that to set up the inner border line. I kept all the markings visible as I partially bordered the piece. (Here are instructions for how I do borders with piping: creating borders). I marked locations and created a signature to show how I position the signature embroidery, as well. 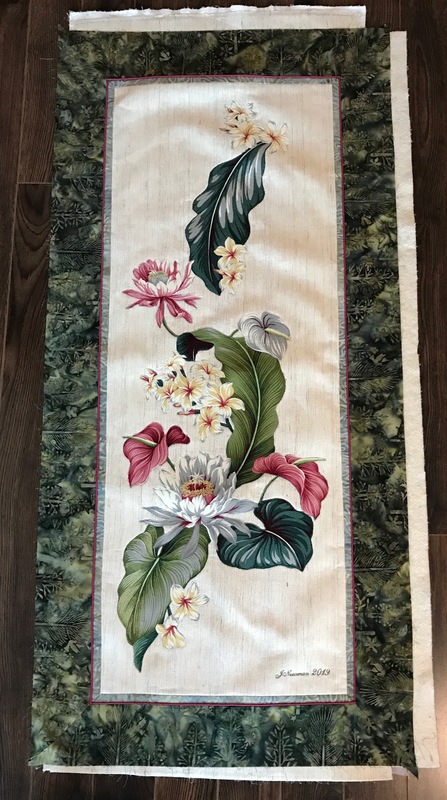 Then I began thread painting – this is going to take several weeks – there’s a lot of fabric to cover – I did enough on the leaf on the bottom left to give an idea of how I shade the colours using two different but similar rayon threads through my needle eye. This provides a bit more texture than using just a single thread and lets me fill in spaces more quickly. My plan is to eliminate the grey on leaves and flowers using other shades to in-fill spaces. In this leaf, I’ve used pale greens/yellow greens to stitch in the grey areas. 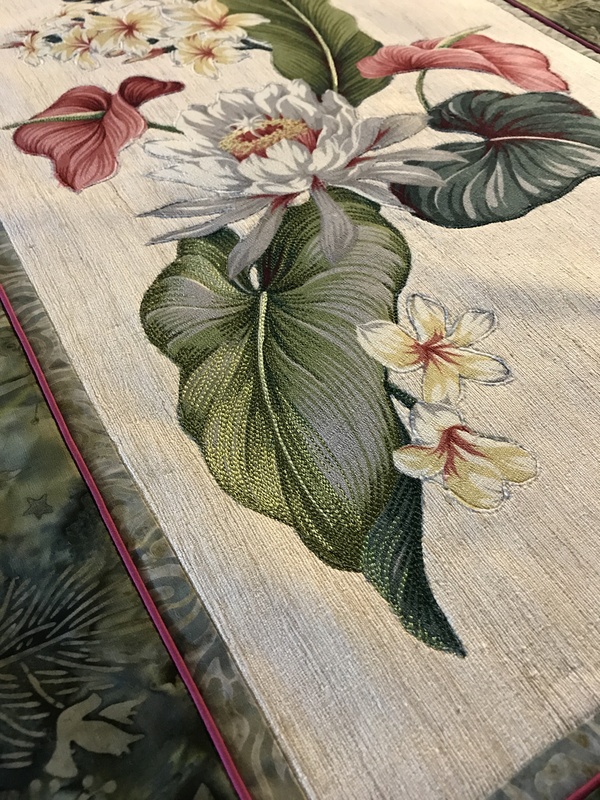 I also did pistils on the anthuriums, flower stems, and leaf central veins while I had a specific thread combination on the machine. This is not my usual way of working but in order to share technique with the gals I did a lot of skipping around. Now I need to settle in to resume thread painting; this weekend I plan on finishing this leaf and move on to the darker green one above. I also need to baste the edge of the outer border to the batting so I can more easily move the piece around while threading painting. Fantastic. Very excited about the piece. Just got home late last night, now have 15 hours of time difference to work through.